This option allows you to take your whole pension pot in one go as a lump sum. However, if your pension pot with us is in more than one policy, you can treat each policy as a separate pension pot. You do not have to take the benefits from all of your policies in the same way or at the same time. If the value of your pension plan is less than £10,000, you may be able to take your lump sum as a ‘Small pot payment’. A key benefit to taking a Small pot payment is that you will continue to be entitled to tax relief on a higher amount of future pension savings, currently up to £40,000 (or the amount of your earnings, if less) each year; the same amount as people who have not taken a lump sum from their pensions. You are allowed up to three Small pot payments in your lifetime. If you take your whole pension pot in one go as a lump sum other than as a Small pot payment, the tax relief you are entitled to each year on any future pension savings will be restricted to the amount of the ‘Money Purchase Annual Allowance’ (MPAA), currently £4,000 per annum, and you’ll be charged additional Income Tax on contributions in excess of this. Your future pension savings to which the limit applies, include contributions paid by you and/ or your employer into a defined contribution pension (i.e. a pension other than a scheme that pays you benefits based upon your final salary). You should consider this carefully if you intend to continue saving for your retirement after you have taken your pension pot in one go as a lump sum. If you take all of your pension pot in one go as a lump sum, 25% (one quarter) of your pension pot will be paid tax free and the remainder will be taxable as income. The lump sum may increase your overall income such that you will need to pay some tax, even if your income is normally too low to pay tax. If you already pay tax on your income, you may find that the tax on part of your overall income in the tax year that you take your lump sum, is charged at a higher rate of Income Tax than you normally pay. We will deduct Income Tax from your lump sum payment before you receive it, in accordance with HMRC rules. The tax that HMRC rules require us to deduct may be more or less than you owe. It will be your responsibility to contact HMRC to obtain a refund, or pay any additional tax due. Taking your pension pot in one go as a lump sum could result in you paying a large amount of tax. For most people, especially those with larger pension pots, it will be more tax efficient to take the benefits from their pension pot as a flexible retirement income, a number of lump sums, a guaranteed income for life, or a mixture of these. If you take a lump sum, depending on your circumstances, you may create or increase any liability to Inheritance Tax that may apply on your death. The current point at which Inheritance Tax applies to an estate value is £325,000. Please bear in mind that the government may change tax rates and rules in the future. The example below has been prepared to help you consider the tax implications of taking your pension pot in one go as a lump sum. This shows how much income tax a fictional character might pay on money from their pension pot and how much tax they owe. George is taking a lump sum payment for £30,000 on 01/05/2018. 25% (£7,500) is tax free and the remainder of £22,500 is taxable under PAYE. 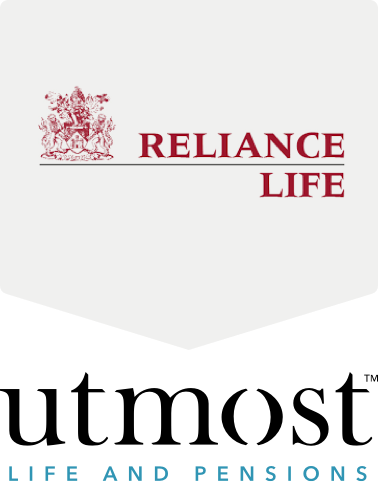 Reliance Life deduct tax of £8,479.95 (based on the emergency tax code of 1185L M1 non-cumulative) as specified by HMRC and make a payment to George of £21,520.05. HMRC review George’s tax position for 2018/2019. His earnings from employment are £5,000 and the lump sum payment of £22,500 take his total earnings to £27,500. First £11,850 is tax free as his personal allowance is 1185L. George’s remaining income of £15,650 is taxed at 20%, totalling £3,130. As Reliance Life have deducted £8,476.95, George will need to contact HMRC to make a reclaim of £5,346.95. HMRC review George’s tax position for 2018/2019. His earnings from employment are £35,000 and the lump sum payment of £22,500 take his total earnings to £57,500. George’s highest tax rate is 20% currently. George will need to reclaim £1,746.95 from HMRC. HMRC review George’s tax position for 2018/2019. His earnings from employment are £100,000 and the lump sum payment of £22,500 take his total earnings to £122,500. Adding the lump sum payment of £22,500 to his annual income keeps his total earnings in the 40% tax bracket. Some pension pots contain ‘Safeguarded Benefits’, which provide a potentially valuable guarantee relating to the ‘income for life’ option. The guarantee may entitle you to receive an income for life that is higher than would normally be available. The information provided to you with this Fact Sheet will tell you if any part of your pension pot includes Safeguarded Benefits. If it does, we recommend you obtain professional advice before making a final decision that involves losing that guarantee. And if the value of the part of your pension pot that includes such a guarantee is more than £30,000, we are required to obtain confirmation from your adviser that you have received appropriate independent advice, before we may release any of that part of your pension pot as a lump sum. Taking your whole pension pot in one go as a lump sum could affect your entitlement to State benefits, now or in later life. If you are currently receiving state benefits and/or you expect to receive them in the future, you should check whether there may be a reduction in your entitlement to them if you choose to take your whole pension pot in one go as a lump sum. There is more information about how obtaining a lump sum can affect your State benefits at GOV.UK. If you choose this option you won’t be able to change your mind subsequently, so you need to be certain that it is the right choice for you. If you take your pension in one go as a lump sum, you will not receive a regular income for life from your policy and neither would your spouse, civil partner or dependant, if you die before them. Before deciding, you should consider what other sources of income are available to you, and others who may be dependent on you for income. You may risk running out of money in your retirement. If you have any outstanding debts, then any lump sum taken from your pension pot may be available to your creditors if you fail to keep up your payments to them. If you re-invest your lump sum rather than leaving your pensions savings where they are, there is a risk that you may face higher charges, achieve poorer investment performance or pay tax on the interest or growth that is not payable in your Reliance Life pension. When investing a lump sum, you should be alert to the dangers of investment scams. In particular, be wary of anyone who contacts you ‘out of the blue’ offering you free investment advice or an investment opportunity that seems too good to be true. You should only seek investment advice from a firm that is authorised by the Financial Conduct Authority.